Using BlackBoard in a Successful Redesign John Broida Psychology department, University of Southern Maine Redesign Scholar, National Center For Academic. 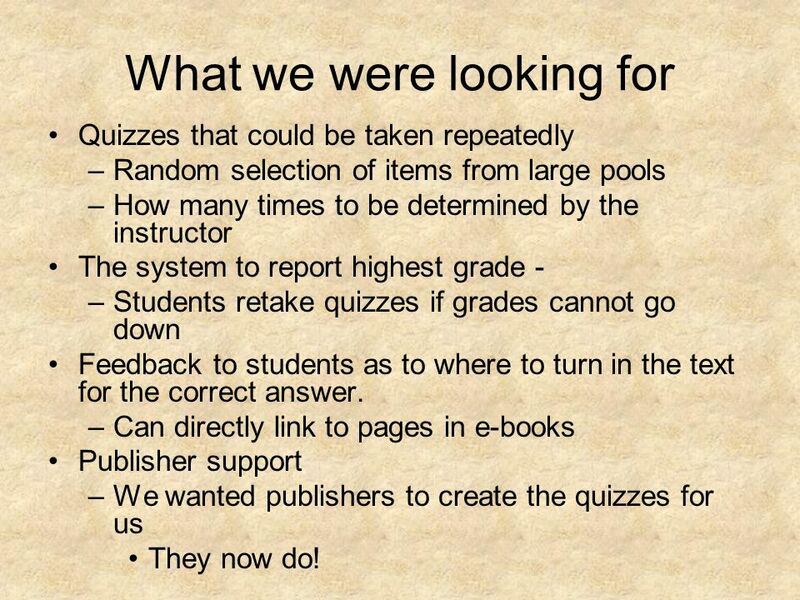 2 What we were looking for Quizzes that could be taken repeatedly –Random selection of items from large pools –How many times to be determined by the instructor The system to report highest grade - –Students retake quizzes if grades cannot go down Feedback to students as to where to turn in the text for the correct answer. –Can directly link to pages in e-books Publisher support –We wanted publishers to create the quizzes for us They now do! 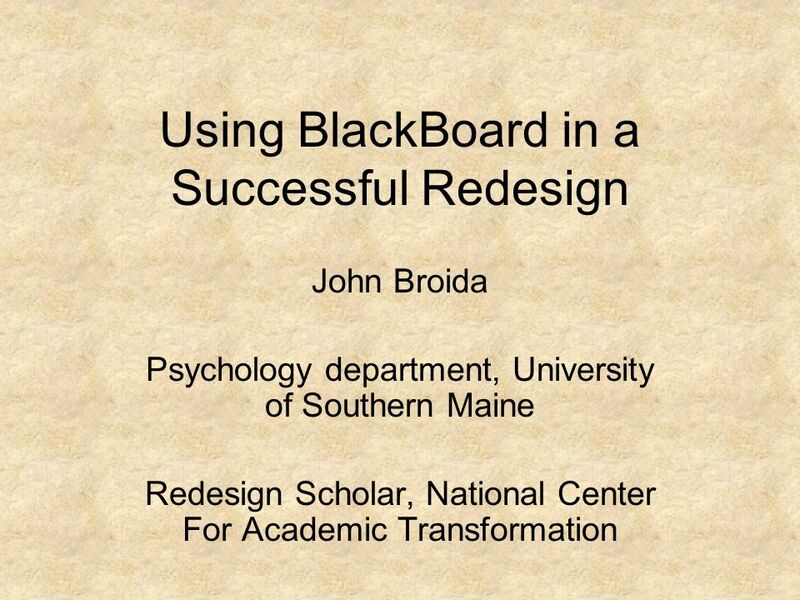 Download ppt "Using BlackBoard in a Successful Redesign John Broida Psychology department, University of Southern Maine Redesign Scholar, National Center For Academic." The Redesign of General Psychology (PSY 101J) at The University of Southern Maine John Broida Associate Professor NCAT Redesign Scholar. Teaching Techie You can be one too! 15-Jan-091© Sarah Lelgarde Swart, MM, MLIS – Muskegon Community College Center for Teaching and Learning. Using CONNECTschool ™ McGraw-Hill Ryerson. What is CONNECTschool™? CONNECTSchool™: A web-based program that includes a searchable eBook, interactive teaching. Mr. Fry Information Technology, 8 th Grade Room 407. Christine Doherty Lydia Li Karen Tsao Stanford University (aka Tests & Quizzes) S akai A ssessment M anager I G O.
June 10-15, 2012 Growing Community; Growing Possibilities Christine Doherty, Stanford University Lydia Li, Stanford University Lynn Ward, Indiana University. Course Orientation Tests & Quizzes Tool. If the instructor has added “Tests & Quizzes” to the course as a form of assessment, click on the link in the. What is Moodle? Moodle is a web based Course Management System That allows the classroom to extend onto the web. 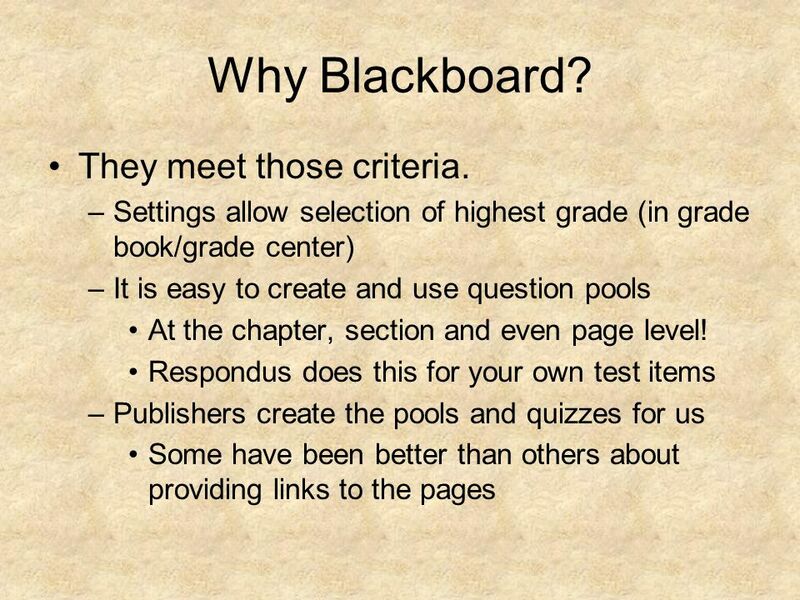 Moodle is similar to WebCT and Blackboard. Quizzes Bill Weber E-Learning Operations. Workshop Overview Tell Show Share? Section 1.2 Question 1 ConcepTest Chapter 1. Section 1.2 Answer 1 ConcepTest Chapter 1. Section 2.6 Question 1. Section 2.6 Answer 1 Section 2.6 Question 2. Carol Rentas and Marcia Firmani Lunch and Learn January 14, 2015. CIS101 Introduction to Computing Week 02 Spring 2004. A SSESSMENTS PRESENTS. THWACK! BIG DADDY M MALCOLM HAYS Instructional Developer 5 years with EdTech WHO AM I? P. Bartolomeo 1 USING SAM/TOM for Online Training and Testing Introduction to Computers. WebCT: Managing Students and Communicating FITC Staff.